Photo: D.O. Pearson House, ca. 1890, Pearson and Market Streets, Stanwood, WA. Listed on the National Register of Historic Places in 1973. Photographed by Joe Mabel (own work), 2007, [cc-by-3.0 (creativecommons.org/licenses/by/3.0)], via Wikimedia Commons, accessed October, 2014. Snohomish County Courthouse is located at 3000 Rockefeller Avenue, Everett WA 98201; phone: 425-388-3411. Everett was not the county's first seat of government. Snohomish County was formed by a Legislative Act of January 14, 1861, which designated Mukilteo the county seat. Six months later, county residents voted to move the seat to Snohomish, a small but bustling shipping community several miles up the Snohomish River, which debouches into Puget Sound above the peninsula which eventually would become the Everett town-site. 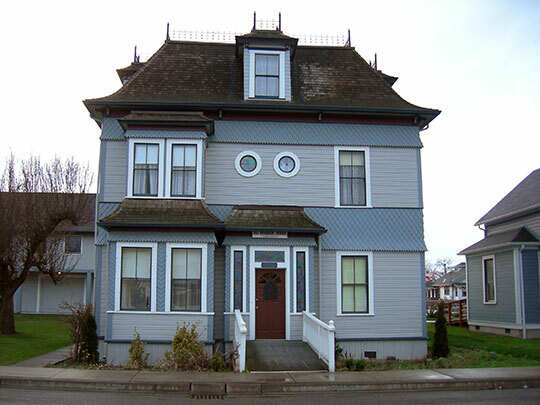 County business was conducted in Snohomish office buildings, fraternal halls and, ultimately, in a specially constructed courthouse for thirty-six years. Finally, in 1897, Everett business interests succeeded in a campaign to shift the county seat to Everett. The Everett Land Company donated lots on Block 716, the present site, and the corporation's architect, August F. Heide, drew plans for a commodious, three-story brick and stone courthouse in the Chateauesque Style. With assurances of Everett Land Company backing, County Commissioners entered into a construction contract, and the building was opened for use on February 1, 1898. In 1908 the facilities were enlarged by a two-story brick annex on the north end. Sparks from a fire which originated in a carriage and wheel factory directly across from the site on Wetmore Avenue spread to the courthouse roof on August 2, 1909, and in the ensuing destruction the annex was all that could be saved. County government functioned in the annex until a new building was erected upon the foundations of the old. Potter, Elizabeth Walton, Washington State Parks and Recreation Commission, Old Snohomish County Courthouse, nomination document, 1975, National Park Service, National register of Historic Places, Washington, D.C.